never achieved such fame as Casper the Friendly Ghost or Wendy the Good Little Witch was because the horror he represented offered less scope for "cuteness" — Hot Stuff was an actual baby devil; his horror that of Hell itself. 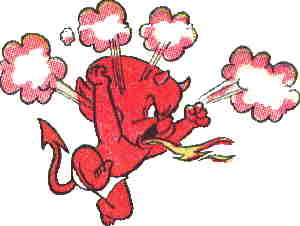 Hot Stuff the Little Devil #1, where the li'l imp made his debut, was dated October, 1957. His creation is officially attributed to Alfred Harvey, one of the owners of Harvey Comics, tho much of the early tone of the series was set by cartoonists Howard Post, who did a majority of the stories, and Warren Kremer, who drew most of the covers. The comic's long-running back-up feature, Kremer's Stumbo the Giant, made its first appearance in #2. Hot Stuff was spun off into a second title, Hot Stuff Sizzlers, in 1960; a third, Devil Kids Starring Hot Stuff, in 1962; and even, briefly, a fourth, Hot Stuff Creepy Caves, in 1974. But these flourished only in a period when most Harvey characters managed to sustain multiple titles. Sizzlers ended in 1974, Creepy Caves in '75 and Devil Kids in '81. Hot Stuff's original title lasted until 1982, when, like all Harvey Comics, it went on hiatus. He appeared in comics again, sporadically in his own book but mostly in back-up stories, from 1986-94. Since then, no regular Harvey comics have been published. Hot Stuff never managed to get out of the comics medium. At this point, with many vocal people apparently seeing a connection between characters like him and devil worship, it seems likely he never will — but he's gone all these years without his creators being hunted down with pitchforks, so you never know. Text ©2000-06 Donald D. Markstein. Art © Harvey Entertainment.